Swiss fondue is not just melted cheese with bread dipped in it; it’s an opportunity to gather some friends around a heaving pot of bubbling cheese and having a great time. The word fondue is a riff of the French verb fondre, which means “to melt.” So theoretically anything melted could be a fondue, although I didn’t see any chocolate fondues in Switzerland and if you mentioned one to someone they might give you a funny look. Fondue isn’t that hard to make (or eat), and I recently had an authentic one in Switzerland that I spent all night afterward thinking about it. Of course, I’m sure that digesting a big pot of melted cheese probably had a little to do with that as well. One thing I loved about Switzerland, or at least the Vaud region, is that folks mostly drink white wine, which is always served quite cold. 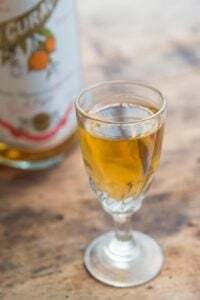 It makes the perfect accompaniment to fondue and if you make it, I suggest pairing it with a dry Swiss wine, or something like Sauvignon blanc, making sure it’s well-iced, to offset the richness of the melted cheese. I had my astounding fondue at Café du Grütli in Lausanne, made by an Austrian chef who’s been making fondue and other local specialties for nearly thirty years. The upstairs dining room of this comfy local bistro is lined with mounted skulls, attesting to the hunting his brother-in-law does for the restaurant. There wasn’t any game on the menu when I was there, but even if there was, I still would order the cheese fondue. It was that good. But then the next morning, he called and asked if I wanted to go to the market and buy the cheese with him earlier in the day, and I jumped at the chance; how can anyone refuse to go to a market with a local chef? Then he took me over to a market vendor, whose table was piled with baskets of earthy wild mushrooms, a few I’d never seen before. He made me smell one, which was damp with humidity and he told me he was going to use those in omelettes at the restaurant. The residents of this Swiss city are pretty advanced about using locally-grown foods and the market in Lausanne is street-after-street lined with farmers selling everything from choux Nordique (kale) to interesting and odd varieties of leafy greens and squash. I would say that less than ten percent of the items I saw were shipped from other countries, or even from outside of the region. Chef Prutsch buys his rosy Gala apples at the market for the tarte Tatin he serves in his restaurant and his frites maison are made from potatoes sold by a farmer who he’s bought them from for years and years. Fondue is so popular in Switzerland that cheese vendors sell a pre-made ‘mix’ of cheeses, already grated and ready to go. When I went to a major department store in Lausanne, the shelves were packed with every kind of apparatus, and fork sets, one could want for making and eating cheese fondue. 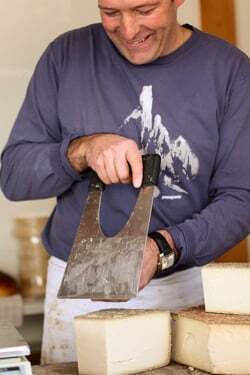 Chef Prutsch buys his cheese from André Macheret, who sets up at the market in the center of Lausanne that sprawls out across the winding streets in the city on Wednesday and Saturday. We stopped by and unlike France, where you trust the judgment of your fromager (who is, admittedly, invariably right), the cheese vendors here are happy to hand out copious samples. Of course, it completely worked and I bought three huge wedges of Gruyère to bring home because each one was better than the previous sample. They’re also constantly bagging up a pre-made mélange of cheeses for people to make fondue at home. When I was in the railway station, en route back to Paris, the corner store-style market in the station had pre-packed bags of them as well. Now that’s my idea of take-out! 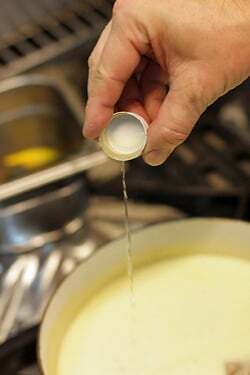 Making fondue is as simple as this: You heat up some white wine with chopped garlic, add grated cheese and a bit of cornstarch, then heat it up while stirring until it’s thick and creamy. And that’s it. I read a few things about fondue, which included warnings not to heat it over high heat, but the heat the chef was using seemed fairly hot to me. 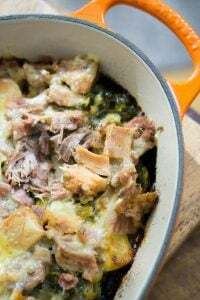 And in spite of the fact that I have seen recipes that used various cheeses, you do want to use a mountain cheese, such as Gruyère, Comté, or top-quality Emmenthal, if you’re looking for authentic taste. This would be considered a Fondue Moitié-moitié, which means it’s part Gruyère and part Vacherin Fribourgeois. And chef Prutsch told me that his mix is roughly 60%/40%, tipping in either direction, depending on the seasonal variations in the cheeses. 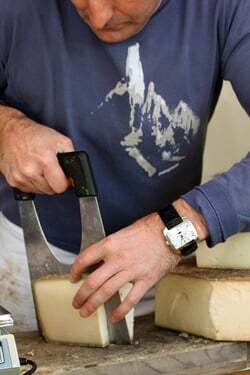 His Gruyère is typically aged for 10 to 12 months and the Vacherin Fribourgeois (which is different than what the French refer to as Vacherin cheese, which is a larger circle of Mont d’Or cheese) gets about 4 to 5 months of aging. 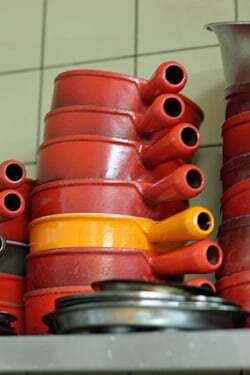 He also prefers to use glazed enameled pots because they’re durable and thick enough to stand up to high heat. And since they make 50 to 100 fondues a night, I think he knows what he is talking about and was glad I bought some cheese at the market to make it at home. Although I do wish I’d bought a bag of the mix*, just because I like the idea of something you just dump in a pot, stir around, and serve it forth. For those who say they don’t have time to cook, I don’t think you can find anything easier than fondue. And no clean-up either—just one pot to wash. I love that, too. The fondue is ready when it forms a ‘skin’ across the hole in the spoon. 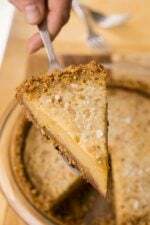 That’s when it’s reached the just-right texture of thickness and stickiness. You can add some kirsch to it when you’re done, but I tasted the fondue before and after he added it and to be honest, as much as I love kirsch in lots of things, I preferred the fondue without it. And she was right; a little touch of kirsch in there was just spot-on. She also told me that if you drop your bread chunk into the fondue, you have to kiss someone at the table. Since she was right about the first one, I took her word on the second one, and was certain to not lose any pieces of bread in the creamy pot. The best part, of course, is when most of the liquid has boiled off in the pot and all that’s left is just a thick glop of almost-stiff cheese. And just when you feel like you’re about to burst you wonder what do you eat for dessert after polishing off a whole fondue with friends? 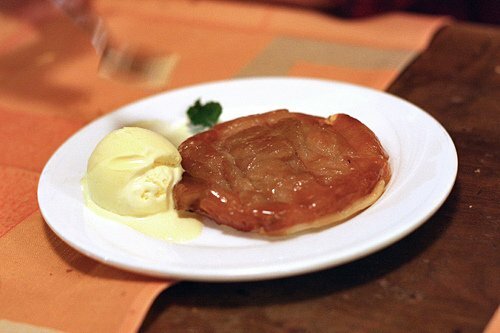 I love tarte Tatin, the upside-down caramelized apple tart, but it didn’t seem right to order it. For some reason, the Raisins secs à la lie sounded good to me: golden raisins macerated in marc (clear distilled brandy) along with a cold scoop of vanilla ice cream. And I later discovered that my instincts were right and that’s considered the classic dessert after cheese fondue. To keep the peace, we ordered a few desserts and surprisingly, my appetite rose to the challenge posed by the tart, although the boozy raisins were still my preferred dessert and I didn’t offer to share with anyone. After all, what good is being in Switzerland if you can’t hide something valuable from others? As I was putting on my coat to leave after making fondue with the chef, I noticed the crew was sitting down to staff meal before the dinner rush. And even though some of the staff members have been there for over a decade, spending night-after-night tending to pots of bubbling fondue for guests, guess what they were sitting down and having for dinner themselves? Adapted from Chef Willie Prutsch of Café du GrütliThe chef uses a combination of Vacherin Fribourgeois and slightly aged Gruyere. You could use whatever is available. Avoid a dry, well-aged cheese as they tend to be rather salty. Use cheeses that are less than one year old. 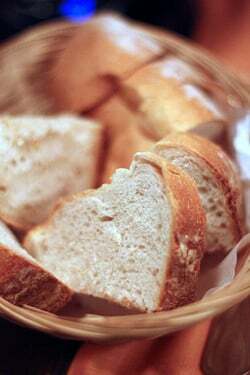 There’s some notes at the end of the recipe.The bread we dipped was dense white bread with a nice crust. Whatever you use, it should be thick-cut and on the drier side but not crispy. When the fondue is finished, the hardened cheese at the bottom of the pot, called la religieuse is considered the reward for finishing it—it’s considered the reward for getting through it! *Interestingly, when I got back to Paris and made this at home, when I was at the supermarket, I checked the cheese aisle and there were a couple of fondue “mixes”. One was a packet of pre-grated cheese and the other was a stout container encasing something that felt quite solid inside. I don’t know what was in that one, but the grated cheese version had more appeal. I adore fondue! It reminds me of my childhood, my mom would make it and we would sit around the table on a cold, wintery night. I like the traditional swiss cheese the best – though of course today there are many different versions! There’s nothing better than real, authentic Swiss fondue! I did have a place I loved to go to eat the “real stuff” that wasn’t commercialized and insanely overpriced, but sadly it is no longer open. I haven’t found a good substitute since and that was years ago! Reading this post really took me back and reminded me that there’s nothing better than a pot of melted, bubbling potent cheese! My favorite thing to dip is apples because it really brings out the richness of the cheese. Thanks for the great post David. We love fondue and make it frequently to enjoy on coldish evenings during the winter in Northern CA. We have wonderful glazed enamel pots. We also own a home in Provence and I have tried to find similar pots for our home there. But all we find in the shops are metal ones. Any ideas where I could find enamel pots in Paris? I will be there in a couple of weeks. Most recipes I have seen or used for fondue call for rubbing the pot with cut garlic. 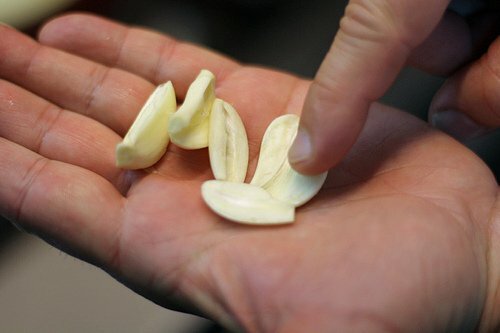 I leave my garlic in during cooking to give it more garlic flavor. But I am definitely going to mince the garlic as we are garlic lovers. You’ve convinced me! For the holidays, I’m going to buy a fondue pot and all of the necessary accessories, and have some fondue. It’ll be great to sit down to have it after decorating the tree, don’t you think? Having never had a proper fondue, I’m so looking forward to it! And Gruyère and Emmenthal are two of my absolute favorite cheeses. 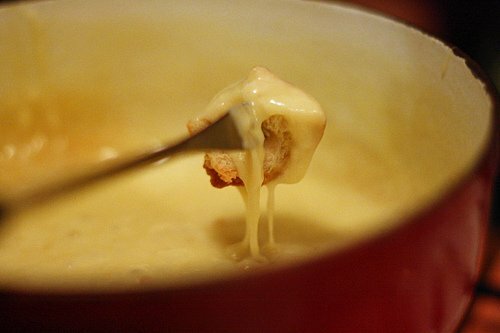 Love Fondue on cold days – it’s warm, thick, gooey consistency seems to stick with you and warm you up from the inside. 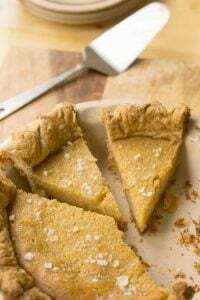 I always slice up an apple or two and serve them along with the bread for dipping (Gala & Honey Cristps are my favorite – the sweet plays nicely against the cheese, though the tart of a Granny Smith is nice, too). I’ve been coming and lurking for a year or two, but don’t recall whether I’ve ever commented. This post, like so many you do, is so informative–I always think that–why don’t I say so?! I notice that you left a comment on my site when my husband was in the hospital with heart surgery, which really touched me–thank you so much. It was a really tough time and well wishes helped a lot. Was hoping to see you at BlogHer, SF–but maybe in some other venue soon. Congrats on Ready for Dessert’s selection by Epicurious, BTW. 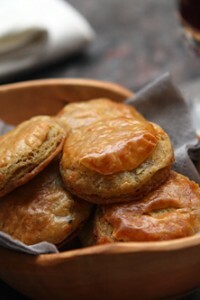 If you have no objections, I thought I might feature one of the recipes on my site soon? 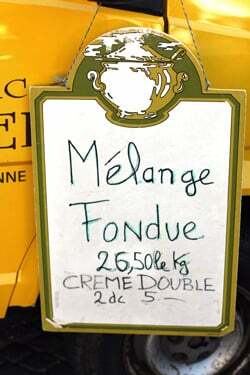 What a coincidence, we had a fondue last night and very much enjoyed it as usual. Normally I make it from scratch but this time I had one made by the people who make President butter and it was delicious. I have a fondue burner with four burners and use cast iron pots ( similar to those in your photo) sometimes we have two different cheese ones and also do a fondue bourguignonne (living in Burgundy it seems only appropriate. My fondue cookery book is a 1970 edition by Alison Burt! We’ve had so much delicious cheese (and wine, and bread) there! I always had a difficult time ordering anything other than fondue in Switzerland except raclette. When not making a large dinner on Christmas Eve fondue was always a favorite, fast and easy like you say and key element of no clean up. I do remember having chocolate fondue in Switzerland but not at all restaurants. Enjoyed the post and will put fondue on my list of ingredients to buy this week. Thanks. 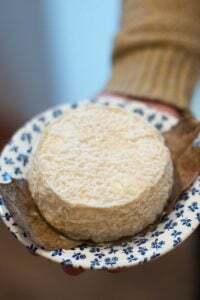 Jenn: It was funny because he kept saying “Vacherin” should be added, which in France, is that super-soft runny cheese (I was thinking, “No wonder the stuff is so darned good!”) Then I saw the stuff they used. Oddly, I didn’t think I’d be able to find it easily in Paris, but I did. Nancy: Glad you like the book and hope everything at home is working out for the best! Michel: The stores around Les Halles have them, as well as department stores like BHV. 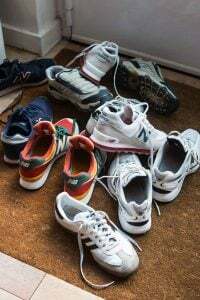 You can also score used ones at flea markets and brocantes. 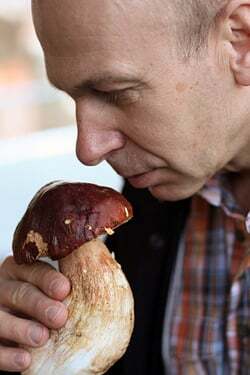 That’s a real teaser picture of the chef with the mushroom. Could you share anything about it with us? The Swiss are also big on what they call “fondue chinoise”- a hot broth kept hot over a fondue burner, in which they cook very thin slices of meat, which are then eaten with various sauces- mayonnaise, ketchup, sauce au poivre, sauce bourguignonne, mustard… Down in Geneva, this is the traditional “réveillon” (New Year’s Eve) dish. There’s also fondue bourguignonne, which is the same only with hot oil, and I think a couple of others. I’m not a big fan of either- a few years ago, when my husband invited a bunch of people home for the réveillon, I horrified most of them by saying that I found fondue chinoise boring (well, it’s slow, and it gets on my nerves as you never end up feeling like you’ve had a proper meal! ), and sticking to frites with the various sauces- whilst they shoveled the meat down. Hey, it was my party, I didn’t have to eat what I didn’t want to! You have convinced me to blow the dust off my fondue pot. That Gruyère looks amazing, no wonder they eat so much fondue in Switzerland! Is bread the only traditional accompaniment to cheese fondue in Switzerland? I know that people have mentioned apples but I think a nice firmer variety of pear would be delicious, maybe some firm red grapes. I think that grapes really bring out the creaminess of cheese. Looks delicious as always! I love the pictures of the oversized mushroom. Err….yes, i bet you loved that mushroom sniffing snap. Mushrooms that round and bulbous must add a terrifically gamey musklike fragrance to the fondue. Thanks for the recipe! I’ve never been one to fondue, but now that the weather is getting colder, and winter is coming. I’m going to try your recipe with my wife! looking forward to it. I have three — THREE — fondue pots, and have yet to successfully make fondue rather than a glop of melted cheese strings. But I have faith in you, David, so I’m going to try this. Cover me; I’m going in. Lovely post. I’ve been consuming fondue in some form my entire life, yet I’m not Swiss. However, my Swiss girlfriend taught me her family’s recipe, which is very close to yours here, except I mix the cornstarch and kirsch together to form a loose paste and then add it after the cheese has melted completely. 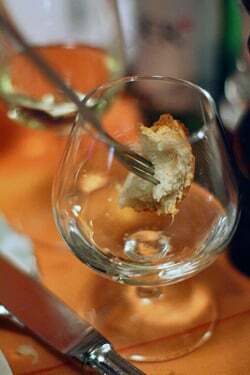 I’d never heard of dipping the bread in Kirsch before – and that is likely to spell trouble. I’m excited to try that idea. Thanks for sharing the beautiful images. I’ve actually never had fondue either. It’s always something I’ve seen as a throwback retro dish in movies, but how bad could melted cheese be?! Looks delicious!! What about the recipe for the golden raisin dessert????? That looked delicious…. Growing up in the middle and I mean, the “middle” our food always seemed exotic as compared to other families’ food. My mom, however, had a hankering for interesting food. We have had fondue for Christmas Eve as long as I can remember, which is probably back into the late 60’s, and my mom (and now I) make it as you have described above. I remember that she always searched high and low for the perfect Gruyere (probably the first French word I learned) and Emmenthal. To this day, the fondue meal makes for a perfectly slow, enjoyable holiday dinner. We also use hot oil for meats and seafood, but the cheese is my favorite! Forget the fondue– you saw kale?! Got a kilo you’d be willing to part with for black market price?? Oh. My. Gosh. My mouth is watering. I have only ever used my fondue pot for chinese steam boat because it seems so indulgent to have that much cheese at home… but now the weather is getting colder I think i might have to bite the bullet and have a fondue party. YUM. I keep telling my kids about fondue… maybe I’ll make it for them. I was served a dish in Luxembourg that my host mom called “Chinese Fondue”. We had a pot of broth and dipped a variety of meats and veggies in it to cook, then ate them with lots of different sauces, and with rice. Anything that fell in the pot was left in it, and at the end of the meal she turned the pot into egg drop soup. http://mykugelhopf.ch/2009/02/half-and-half-but-both-halves-cheese/ – it has lemon juice in it, while my (french) husband adds butter to his fondue. in case, you know, there isn’t enough cholesterol in there…! great swiss posts, will have to add lausanne to my list, and not just for the olympic museum. thanks ! I am ecstatic that it is officially fondue season. 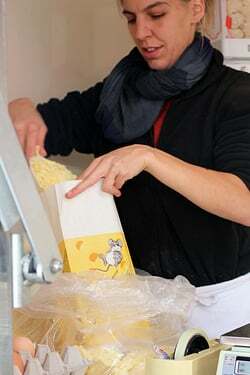 Soon I will be dancing around the cheese stand at the local marché buying as much cheese as I can fit in my bag!!! My French cousins run a fondue restaurant in the French Alps and their cheese mix is Gruyere, Comte and Beaufort. Mmmmmmm…. Oh, and the Kirch is mandatory!!! Nice post. In particular, I love the sentence saying the core of the Fondue: gathering with some friends and have a good time. That’s what the Fondue is about. 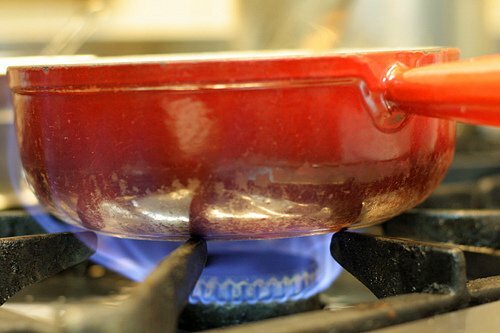 The traditional Fondue Caquelon (pot) is earthenware, but for a restaurant, enameled (cast iron) pots are the better option, as they can stand higher heat better than earthenware. 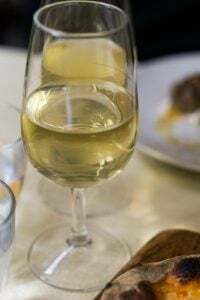 The typical white Swiss wine is made from the Chasselas grape, and for Fondue, it can actually be quite sour; if it is too mild, lemon juice can help. Sauvignon blanc looks to me to be already too noble for a Fondue. Emmental cheese has a tendency to draw strings. If you don’t like strings, stay with the traditional Moitié-Moitié mix. Also, the cheese should really be at the age Chef Prutsch chose. If you want to stay low on alcohol with the fondue, black tea would be the choice. It does not need to be anything fancy, but should have some substance to stand against the fondue. Make enough tea, as a good Fondue is rather salty. 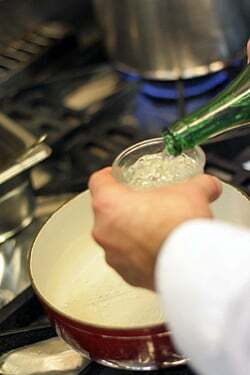 The packaged mixes feeling rather hard could be premixes, already containing the wine, or being prepared as a paste. The traditionalist in me prefers starting from grated cheese (a mixin a bag is OK) and wine. Chocolate fondue: It was promoted in Switzerland some 40 years ago, but I have to meet someone who actually makes it nowadays. In fact, I am not even sure whether the mixes are still available. And now, have fun with your friends around a good pot of Fondue! I swear, I tried another recipe at home and i had a blob of cheese the size of a head floating in white wine soup and pulling the no-stick material off the pan. My kids still laugh and have nightmares about it! 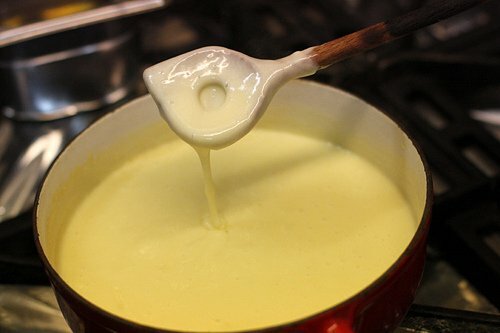 My first job was at a restaurant where we made fondues, very good ones, and we were taught to toss the shredded cheeses with cornstarch before adding it to the pot (any excess starch was left at the bottom of the cheese bowl). We never had to measure anything, as the light coating invariably thickened the fondue perfectly, no matter how much cheese we added. But cleaning all of those fondue pots, oy! I still love making (and eating) fondue, and am so very happy there’s only one pot to scrub at the end! Interestingly, I don’t find Chassela wine sour (in fact, I love it), but it’s hard to find outside of France. I didn’t know that about the Emmenthal/Emmental, so I added it to the notes. I’ve never used it for fondue but that’s sometimes the only Swiss cheese folks can find. But I completely agree that the mix that Chef Prutsch used was pretty perfect. stepahnie: As mentioned, I wasn’t fond of the kirsch in the fondue, but I do love it as a pre-dipping dip! Serene: Do give it a try using the cheeses that the chef recommended, if you can find them. And if you have problems, make sure to have a bit of lemon handy, too. wiping the drool off the floor. Fascinating! It reminds me of my own trip to Switzerland, and I was in Lausanne too. But, I had fondue in Leukerbad. Simply fantastic! Glad you shared the recipe! What do you think about dipping other things in addition to the bread? I think bread is the best….even when I make chocolate fondue (usually just a melted jar of nutella…shhhh! ), I still think bread is the best! But for cheese fondue, I often offer things like steamed fingerling potatoes, broccoli, cauliflower, mushrooms, and salami. Is that considered gauche? I don’t want to be gauche! Also, what is the etiquette exactly? I’ve seen people dip and place the item on a plate and use a different fork to eat it. I’ve seen people pull their lips back and use their teeth to slide the tidbit off. Then there are people like me who enthusiastically lick the fork with every bite! Thank you for a lovely post and for reminding me how wonderful fondue is on a cold, dark night. I love Fondue but rarely make it. However, just the other day, I bought a bag of Emmenthal/Gruyère shredded mix at Trader Joe’s. At the time, I had no idea why I bought it – just knew I had to. Figured I could freeze it and use it for a Thanksgiving gratin. Now I know buying that bag of cheese was destiny — I’m dragging out the pot! …..been making fondue since the early 70’s. it’s been a new year’s tradition for years. another fabulous post. i look forward to reading these everyday! thank you. I always wondered what those wooden spoons with a hole in the middle were for. I remember that fondue pots were a popular gift back in the 70s. I think fondue is making a comeback. But does anyone still have their fondue pot? Having had fondue but twice in my life – and not in a good way .. (once was saggy bread + other misc fruits and bits waiting to be dipped into nasty cheeses back in the 80s – NZ was not really an epicurious place back then!) the 2nd time we had “self healing” (I dare you to eat me) fondue .. I’m none-the-less keen to try it as everyone seems to rave about it. Next Winter, I shall MAKE IT SO .. thanks! (And wish us luck!) NZ has come a long way since the 80’s with our food so this should be something good to experience .. I Hope..
Phyllis: I’ve seen Italians use those spoons for stirring polenta, too. They work well for fondue as well. Hannah: Fondue is actually extremely economical since it’s just cheese, garlic and wine. I used a bottle that cost around $2.50 when I made this at home, and only used one-third of it. Give it a try! Colleen: Basically you spear the bread, swirl it around, then pop it in your mouth. You would not lick the fork, but use your teeth to pull it off. I didn’t see anyone in the restaurant putting their cheese-dunked bread on a plate and eating it that way. There are a bunch of other ways to eat fondue in Switzerland, including dipping meatballs, but this is considered the classic from the Vaud (the region). Last winter when it was really cold, our local highest mountain, Mont Ventoux opened its ski lifts and a friend and I drove over and spent the day skiing (its only got a few runs) and in the evening we came home and cooked fondue and pretended we were in a Swiss Chalet. We got everything in our local supermarket, including the burner. I’m now looking through all the brocants around here for a fondue set that everyone got as an unwanted wedding present in the eighties! Its great to re-visit a classic and to realise why it was a classic! My friend (the Swiss half of her family come from Gruyeres so she’s the real deal!) made a fondue a few weeks ago, and at the end she turned off the flame and cracked an egg in, which cooked over the residual heat of the leftover cheese. Has anyone else seen this done? David OMG, you have done it again! Honestly I don’t know how in the world you come up with this FABULOUS information. The article on Fondue brought back so many memories of trips to S-land and stays at the Zermaterhoff, one of the most delightful places on the planet. Being picked up in snow storms with a sleigh is never forgotten. The Fondues there in the hotel were also memorable. The SWISS just always get it right! Thanks again for a wonderful memory lane. Thanks for this fantastic post David! I’ve only had fondue once and although I don’t remember the fondue very well, it was a fun evening. I’ll be making some soon. Thanks for the recipe. Oh my you make me miss my days living in Switzerland so much! I totally agree with you – fondue is so much more about just cheese and tipped bread. It’s about bringing people together sitting around a table enjoying food and having a good time. It’s something to have once in awhile but honestly it’s just a bit too heavy for me. wow! This comes just in time, David. I love cheese fondue even though most people around here prefer meat fondue. You know, where you dip pieces of meat in boiling oil or bouillon. Not for me! Since my birthday is in the cold part of the year, I often invite friends to a restaurant for some good cheese fondue. Somehow the cold and the fondue just go nicely together. But now I will give it a try and make it myself this year. My favorite fondue memory: Sitting in the window of a tiny, cozy fondue restaurant in Davos, Switzerland. Snowflakes dancing outside in the cold and nice and warm inside. A dream. By the way, have you read the Asterix comic where they go to Switzerland? A hoot! There, instead of kissing a neighbor, they have to jump into the lake (Lake Geneva?) as the ultimate “punishment” for dropping a piece of bread in the cheese. I have a Swiss friend who says that the only beverage allowed with fondue is white wine (specifically Fendent). If you’re a kid, you get tisane. According to him, water will turn the cheese into a ball in your stomach and you will become indescribably ill. This looks so delicious — I can’t wait to test the theory! And I shall keep it at the ‘look’ stage. The reclette at Borough Market was tough enough to look at and just admire. Funny – what goes around comes around. We got three (yes, three) fondue pots when we got married, but that was 41 years ago yesterday. They came complete with long forks. If you weren’t careful you can (I know from personal experience) burn your mouth on the forks. Kirsch was used then too. Thanks for bring back memories. I will definitely give yours a try. I think hand grating the cheese makes all the difference in taste. Mmm, there’s nothing quite like hot, melty cheese to warm you up on a cold winter’s day. Your post brings back fond memories of the few months I spent in Annecy where I fell for raclette, tartiflette and, of course, fondue. I like the idea of trying it with apple slices. If you ever find yourself in Annecy (it’s a beautiful little place) do try to visit Le Freti which is a great little restaurant specialising in cheese. They have 16 different fondues on the menu using different gruyeres they age themselves in their cellars. I think lack of stirring may be the main reason why it does not properly fuse together (I guess in the restaurant kitchen, they overcome this by using baking powder). 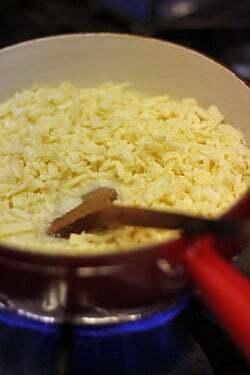 • A trick, probably snarled at in the restaurant kitchen, is to use a little piece of processed cheese, which contains some “sel fondant” (melting/fusing salt), helping the cheese to melt. Wow.. one of my favourite restaurants! Love the Café Grütli and have been a regular there for the almost 7 years I’ve been living in Lausanne. Never had a bad meal yet. The food is great and the staff are very efficient and friendly. Sadly I no longer live within walking distance of the Grütli so I won’t be able to go there this winter for my cheese-fix, but I’ve already bought a set and with the help of the tips here from Chef Prutsch, it sounds like I should be able to make a reasonable imitation. Looking forward to it! Brought me straight back home, almost. I am from Fribourg and I suggest next time to go to Switzerland you try the Fondue Fribourgeoise, made with Vacherin only. 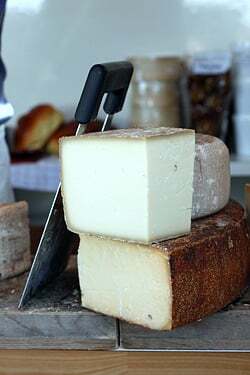 Usually 4-5 types of Vacherins (some more creamy some stronger in taste etc to have a nice balance, the fromager will suggest which are best). There is no wine, no garlic, no kirch, nothing added other than a bit of water and pepper. It needs to be melted very slowly, slower than a moitie moitie. We usually eat it with ‘patates nouvelles’ and bread but it is better with the potatoes. Delicieux! As long as I can remember cheese fondue is our traditional Christmas eve dinner, with mushrooms, bread, dry sausage and green peppers for dipping. I will try the pre-dipping of the bread, never having heard of that before, but I can see the appeal. wise words indeed! thank you for sharing this, it looks amazing. glad you enjoyed Lausanne – I was there about a year ago to see les miz in french and loved the city. When I finally found the market I too was blown away by it and the variety of produce (I was staying in the top half opposite the cathedral so it took me a little time to find the old city!). Spent a pleasant afternoon down at the lake watching the last regatta of the year. Not a huge fan of the cheese fondue (and I love cheese) but I do like raclette. What’s a girl to do where Swiss Cheese is hard to find? I paid $30 for a small block here in Tokyo…. I need to go to Dean and Deluca to see if they have some cheeses….. I like fondue,esp with STRONG hints of garlic..
I’m a bit of a fondue addict myself. I actually own four pots (yes, I’m a bit cheese crazed). I like to add a bit of appenzellar to mine as well. It gives it a little extra tang imo. Those soaked raisins looks really good and a perfect way to finish off the meal! – Auberge du Chalet des Enfants at 1052 Le Mont-sur-Lausanne. It’s one of the many places where the guest is truly a guest, but reservations are absolutely a must. Thank you, David, for these wonderful blogs from Lausanne, particularly this one! Farmers selling their wares along street after street is how I too remember that beautiful town on Lake Geneva. Switzerland is also the place where I had the best cheese fondue ever. 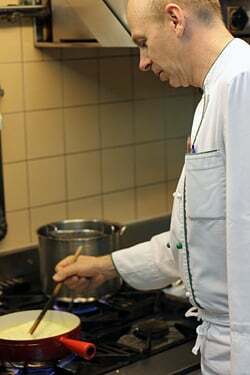 Interesting, that yours was prepared by an Austrian chef. It seems as if a large percentage of Austrians learns the art of cooking and then those chefs settle all over the world, and successfully so. 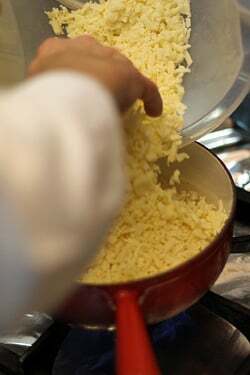 Those grated cheese packs, ready to be married with wine and garlic, follow a trend I see here too: first class ingredients, already chopped, grated, mixed – i.e. time-consuming steps eliminated – building blocks to facilate the preparation of a great home cooked meal. I noticed you did not care to share your Raisins secs à la lie tart. Do you think chef Prutsch would part with the recipe? Oh dear, I should not have come back here to read the comments! Colleen, thank heaven we have not a lick of Nutella in the house, otherwise it would be fondue by now (stirred or shaken, er, microwaved?). Its so nice to read a post about Switzerland. We have lived here for 3 years (a transplanted Aussie) and have really enjoyed the “local” nature of swiss cooking. It can definately be a bit heavy but its always seasonal and uses beautiful ingredients. Fondue is my family’s canonical Christmas Eve meal! To my surprise my father’s method almost exactly matches this one, though he is hardly Swiss. Thank you. That cheese looks soo good! Although I haven’t made fondue before, I’ll have to add it to my list after seeing this. 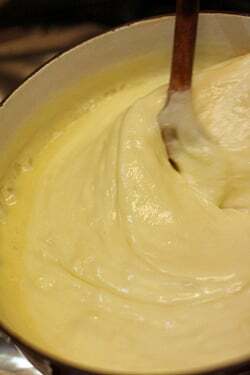 Thanks for writing about Suisse fondue! Friends and I have monthly fondue parties during the unbearably cold winters in Minnesota. I used to live in Lausanne and was delighted that you enjoyed your fondue at Cafe du Gruetli. If you ever find yourself back in Lausanne, I can’t recommend Cafe Pinte Besson enough for classic Suisse fondue (http://www.pinte-besson.com/). Situated in what feels like a cave, it is the oldest pub and serves the best fondue in Lausanne. Bon Appetit. 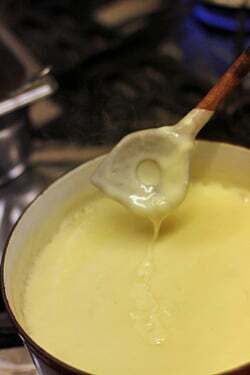 I lived in Lausanne, with relatives in Lengnau, and what I loved most about their fondue (which they made at the drop of a hat and every time I looked longingly at them) was that every time Uncle Urs gave me THE definitive recipe–“this is the way to make it” in a tone indicating that there was no other proper way–and every time it was different. Thinking of the whole family around the fondue pot, looking out at the neighborss’ farms, I can’t remember why I moved back to the States. It’s amazing what a pot of melted cheese can do, almost magical. I can’t think of anything else now, all I want is that pot of fondue to consume all by myself. I made this and your almond lemon layer cake (found on on F&W) for a friend’s birthday this past weekend with wildly positive reviews, people thought I was some sort of master chef but I made sure to give you 100% credit—thanks for being so foolproof! I always know where to go for recipes when it’s for something special. 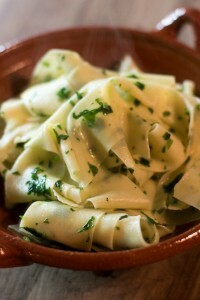 Making this tonight for xmas eve dinner – thanks for your fabulous information! lanterns overhead. The memories you never forget. The best fondue was at La Paix, next to the train tracks. It was close to the Anerican College of Switzerland, the original location. 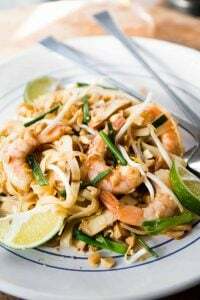 They used the original Canton Vaud recipe. We would live on fondue, in those days, if we could afford it. The year was 1964. I have some in the fridge and think this night may be right.